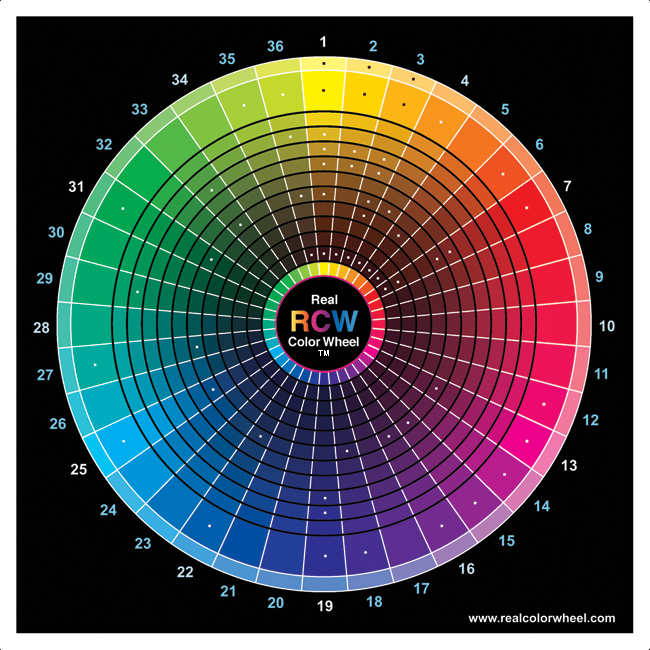 This RCW is made up of thirty-six color wedges, side-by-side around the central RCW logo, each color wedge is 10º, labeled from 1-36 outside the perimeter. The notation, RCW#19, for example, refers to the color wedge labeled 19. The RCW can also be seen as a set of nested concentric rings with the RCW logo in the center. Nearest the outermost tint ring, is the second ring, comprised of pure-colors, this main color ring is "0". The main ring represents either the full-chroma (100%) opaque pigment, or a 50% top-tone tint of transparent pigments. Any of these colors is indicated by appending from ".0" to ".10" to the end of its wedge number. So, pure yellow is written, RCW#1.0, pure Yellow-green, RCW#34.0, and so on. The third appended number is from .1 to .9, this is the cool or warm notation for the color as it relates to the adjacent wedges color. #1.0.1 is the coolest and includes more cyan, #1.0.5 is in the middle hue, #1.0.9 is the warmest and includes more magenta. The first outermost ring is comprised of a lighter tinted version of the pure colors in the main ring. Any one of these tint rings is indicated by appending a double digit number starting with "00" to the end of its wedge number. Thus, RCW#15.00 to #15.09 refers to the outermost tinted rings of wedge #15. 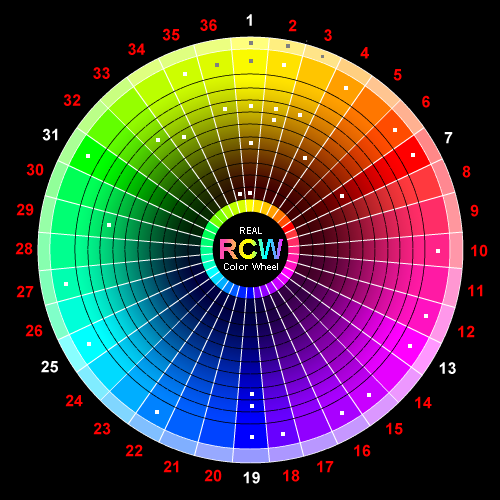 RCW#15.0.1 refers to the cooler location of another pure tubed color inside the pure color ring. A zinc yellow is cooler than a cadmium yellow, both colors are in the same pure color ring. RCW#15.00 to RCW#15.09 refer to lighter versions or tints of RCW#15.0.5, the pure color. The ten rings inside the full-color ring show 10% graduations to the darkest value found next to the center logo. This darkening of a pure color is achieved by mixing it with its true complement as found on the RCW, not black pigment. To denote any of these darker shades, append an integer from 1-10, (lightest to darkest) to the color's wedge number. For example, the darkest Red on the wheel is written, RCW#7.10. ALL DOTS ARE LINKS TO PIGMENT COLORS. The center links to the photo color chip chart. This is an RGB image.